Growing up in Europe, you more or less think of Africa as a continent of more or less failed states cursed by their resources. When I went to university, I started to learn about Botswana. Located in the southern part of the continent, the once third poorest country was turned into a stable democracy embracing free markets and the rule of law and thus dramatically improving the situation of its inhabitants - all thanks to the country's insightful leaders at the time Botswana gained independence from the British in 1966. One of the men who led the way was Seretse Khama. Born into one of the most powerful of the royal families of what was then the British Protectorate of Bechuanaland and chief and King of the Bamangwato people, he became the country's first President in 1966. In another interesting story of his life, he was married to a white woman. 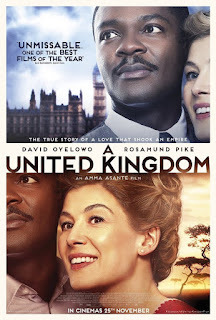 "A United Kingdom", a film released last year, tells the story of Seretse Khama and his wife Ruth Williams Khama. The couple met while Khama studied in England, quickly fell in love and married. However, everyone is against the union of duo: First of all their families, Khama's tribe and also the British government, which fears nothing less than relations with South Africa and the stability of the entire region of Southern Africa. After all South Africa had just introduced Apartheid and a mixed race couple ruling just across the border was nothing the government approved of in the slightest bit. Britain, in difference, needed the access to South Africa’s resources, including its gold, minerals, diamonds, and most importantly, uranium. For all the turmoil and political events around them, the story of "A United Kingdom" remains focused on the love story of Seretse and Ruth. However, their desire to stay together is always connected to the fate of Bechuanaland. What follows is a battle spanning multiple decades though the film remains surprisingly quiet throughout leaving most of the violent political struggles out of the picture. When the film gets a little louder, such as a tribal meeting upon the couple's arrival in Bechuanaland and his time in exile, especially the performance of David Oyelowo shines even brighter. A much recommended film about a lesser known royal couple!